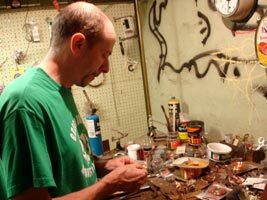 Metals are a large part of Dave Nally's life. 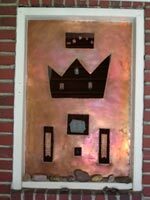 Whether working all day refining steel at Carpenter Technology, a Pennsylvania firm that makes specialty steel, or creating his three-dimensional, innovative, mixed media series using new and recycled copper, metal is definitely his medium. "I make steel for a living during the day by using copper in the steel mill, then come home and transform it into art," explains Nally (aka, Big Dutch.) "I'm a self-taught artist who's been creating art since grade school. I work in a variety of mediums, and I'm known for some of my drawings but, at the same time, I sometimes slip the drawings from my paper and use a mixed medium that includes copper. People always respond to metal artwork with its different patinas. Copper works well for me because it's a great, easy metal to work and people are receiving unique, one-of-a-kind pieces. It's an excellent medium for the way I create." This Reading, PA-based artist uses roofing material that he purchases from several roofing supply companies in Pennsylvania. This is where his technical expertise of using between 18 and 23-gage copper is turned into art. Friends sometimes give him copper that roofers have ripped from jobs, but he also uses gages of copper wire to create jewelry by fabricating jewelry links. His talent has led him to utilize it in a selection of mixed mediums that fuels his imagination. "I wrap sheet copper around a block of wood then fabricate something like a rocket ship," he says. "I solder a long strip of copper to the back, fasten that to the block, and then the rocket ship appears as if it's suspended in air. If a person touches it, it bounces around and motion is provided. I also make birds using the same principle and cut out a heart in the center. People always enjoy three-dimensional work. I just follow my own whims, then place these pieces in galleries or present them as gifts." This talented outsider folk artist also utilizes old doors. He paints them, takes the sheet copper and cuts out flowers or letters for words, then nails them into the door. At that point it becomes an ingenious piece of art. It's not used as a real door in a home because at that point the door could be cut in half. For the past 20 years, Nally has also created trinkets from roofing copper as well as well as all types of jewelry; bracelets, earrings, rings and necklaces. "This is where copper is advantageous for me," he reveals. 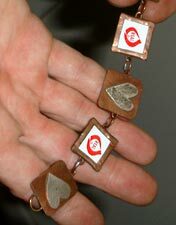 "I'm not a fine jewelry maker and copper is cost effective. I'm a pure soul when it comes to making things. My jewelry is very simple, but on occasion I'll take a painted can - like a whipped cream can - with a logo that says REAL. I'll cut out the logo, and wrap it around copper, then take that square of REAL and link it together in a bracelet or earrings." Nally also designed a copper window that separates his back porch from his house. He removed the glass, replaced it with a sheet of copper, and cut out areas of the copper sheeting to fabricate small trinkets to hang in there - like little houses, apartment buildings, hearts and other icons, that he uses in his drawings to make architectural pieces. Dave Nally's work can be seen at Goggleworks Center for the Arts, and Yard Dog.